New Board of Directors member Jim Carter (left) and newly-appointed Board Chair Gerald Slemko. 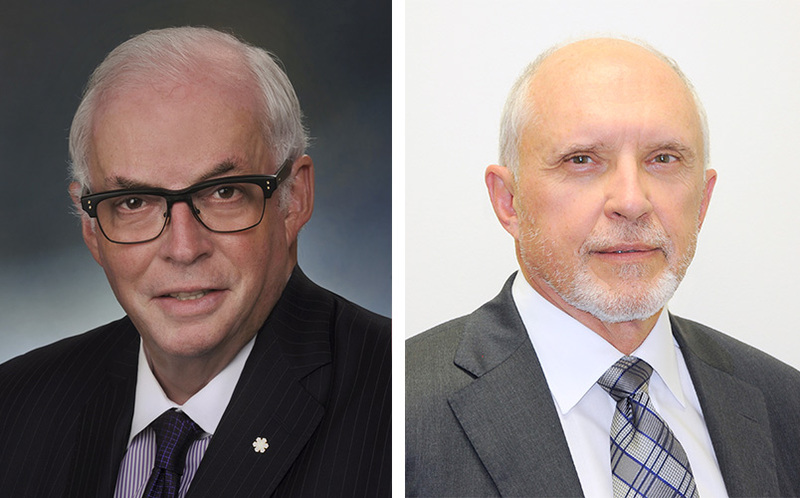 MISSISSAUGA, October 5, 2016 – EllisDon is pleased to announce the appointment of Gerald Slemko to Board Chair and appointment of James (Jim) E.C. Carter, O.C., P. Eng., to its Board of Directors. Gerald is currently the Chief Executive Officer of the Trudell Medical Group, a global medical device company located in London, Ontario. He began his career with PriceWaterhouseCoopers, leaving to pursue a career of Canadian and international entrepreneurial endeavours. He assumed the role of CEO of Cuddy Corporation in 2000, and became CEO of Trudell Medical Group in September, 2015. Mr. Slemko has an impressive record of community involvement and is currently on the Board of Operation Walk Canada, a member of the Board of Directors of the London Economic Development Corporation and Past Chair and Past President of the Grand Theatre Foundation, as well as a number of other organizations. Mr. Slemko joined the EllisDon Board of Directors in 2007, chairing the Audit Committee and working on the Strategic Planning Committee. Gerald assumes the Chair position immediately. Jim Carter served at Syncrude Canada Ltd. for 28 years, including 10 years as President and 18 years in various operations positions including Chief Operating Officer. Prior to Syncrude, Mr. Carter held management positions at McIntyre Mines Ltd. and the Iron Ore Company of Canada. In 2007, Mr. Carter joined the Board of Directors of Finning International Inc. He also serves on the Board of Directors of Irving Oil Ltd., Brand Energy and Infrastructure Services, ATB Financial Corporation (currently Vice Chair), and the Climate Change Emissions Management Corporation. Mr. Carter serves on various not-for-profit Boards including ‘CAREERS: The Next Generation’, Edmonton Symphony Orchestra Society Board and the Francis Winspear Centre for Music Board. In addition, Mr. Carter chaired the Alberta Carbon Capture and Storage Development Council for the Government of Alberta in 2008-09. In 2005, Jim was named the Resource Person of the Year by the Alberta Chamber of Resources, and in 2013, Mr. Carter was inducted into the Canadian Petroleum Hall of Fame. He has also worked as Director and past Chair of the Mining Association of Canada, and as Director and executive member of the Alberta Chamber of Resources. In 2014, Mr. Carter was appointed as an Officer of the Order of Canada.